Many handmade beads that range from funky to elegant. Vermeil, gold plated, shiny brushed or antiqued brass. 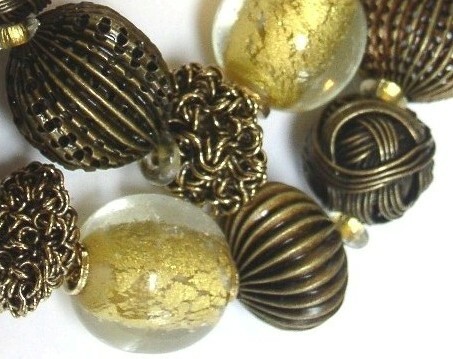 Brass beads are an antique finish, corrugated or filigree. Various shapes and textures that are gold plated or have 24kt gold foil make these pieces dance. These exordinary pieces make luxury affordable. Petite Corrugated Brass Ovals with Gold Foil Glass Beads. Tibetan Cobal Amber Necklace - 1 of 2 left.